Caption of text goes here. Carnival Panorama is the third in the line’s Vista-class series, which are all named to reflect the connection between the vessels and the sea. Indoor/outdoor spaces are key elements of the ships’ design. Carnival Panorama will offer venues with both indoor and al fresco experiences, including the Fahrenheit 555 steakhouse, Library Bar, and Bonsai Sushi, along with open-air attractions like the groundbreaking bike-ride-in-the-sky attraction SkyRide, a massive WaterWorks aqua park, and the SportSquare recreation area. Also featured will be a ‘Havana’ section with tropics-inspired staterooms and its own Cuban-themed bar and pool, ‘Family Harbor,’ featuring extra-roomy accommodations, the Family Harbor Lounge, a Cloud 9 Spa and Ocean Plaza, a spacious dining and entertainment venue with indoor and outdoor seating. 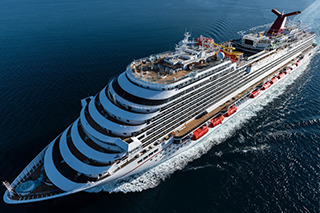 “Carnival Panorama is the perfect name to reflect the design inspiration of our Vista-class ships providing more venues and opportunities to connect with the sea,” said CCL president Christine Duffy. “Carnival Panorama will offer a wide variety of fun indoor and outdoor experiences along with exciting one-of-a-kind features that will provide our guests with a lifetime of wonderful vacation memories,” she added.